Hi Jack! I definitely think you should get a Thundershirt! My little girl (Eisley) wears hers during thunderstorms and fireworks and it helps her tremendously. Hope you have good results as well! Hi! Just a heads up that your latest post isn’t showing up on your website. It came up on my Bloglovin’ feed, but when I went to your website later to show it to my daughter (she LOVES your posts, Jack! ), it wasn’t posted. It might just be a computer glitch on our end, but we thought we’d let you know. Love all your posts, Jack! 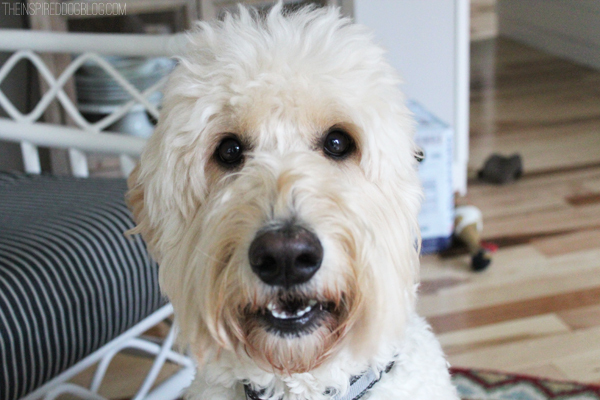 You remind us our of goldendoodle, who also likes to bark incessantly at all the “funny business” outside! I found that my little dog, Maddie (a rescue) would cry when there was thunder. She is not a girl that enjoys clothing at all. It seems to paralyze her. In reading, I found that dogs are most vulnerable in their chest region. Every time I could, when thunder started, I would sit her next to me-sometimes all evening and put one hand across her chest and support her (using some force). I am happy to say that she no longer needs me to do this and her crying has pretty much ceased. Try it! The Thundershirt is amazing. Our dog Samuel absolutely freaks out when our neighbors fire up the fireworks (no occasion is really necessary – this past Monday – was that a “day”?) With the TS Sam is much calmer and doesn’t try to hide under my desk or in the bathroom. Get it!